The original Kaos has to be right at the top with the Super and Ultimate variants right there with it. For a bipe it's the Andrews Aeromaster. As for ARFs I think the original .40 sized Escapade may be one of the nicest flying airplanes available. +1 for the Escapade!! I just got mine flying, and although somewhat overpowered with an FS 70, the plane flies beautifully, and handles very well. Even with the heavier motor, it is only very slightly nose heavy, and slows down nicely for landing. An Ultra Sport is a decent plane too . I still like the Tiger 60 better but the Ultra Sport will perform more maneuvers . I don't fly mine much because I put retracts in it and I find them to be a pain in the tail . They will bend on take off if I am not carefull . Sorry for reviving a dead thread, but I do some necrotic things anyhow. Surprised, but my choice for the most fun would be the Magnum 40, sorry, but you have to scratch it from RCM plans, still available. BUT, you might be tempted to change the airfoil, in doing so, you ruin the plane. The double reflex isn't that hard to cover with an iron on, just make sure the ribs are smooth and iron each rib separately. That plane will hang, engine out, slower than any other plane I've ever seen. It's fairly quick, but not overly fast. Built around a K&B 4011, and that's plenty of power, it doesn't need more. There are a lot of things that can be done to it, none of which will improve anything. Dan Santich knew what he was doing when he designed this one. My error, plans unavailable. Sorry. 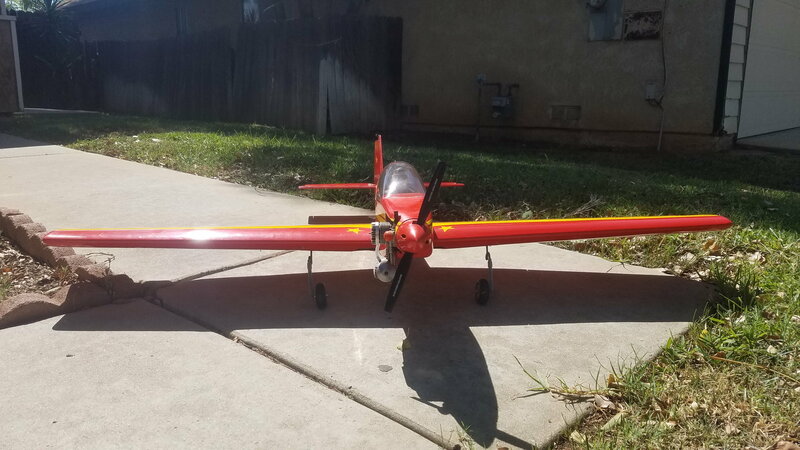 I have a Pro 260 by Aeroworks. It really goes strait up with a 22cc engine on It ! What's a good sport plane (Sunday flyer) for a 20cc gas engine? One would be a Stick but what else. Could be kit or ARF. The 4*120 flys not too bad on a 20cc. The 30cc is better but it really does do well with a DLE 20. Guys flew them for years on 23 and 26 cc weed wacker conversions. The 4*120 looks good. Clipping the wings might help the 20cc. Ill have to look for a build thread. It's getting kinda long in the tooth now, but the 70" Great Planes Revolver is absolutely awesome powered by a 20. Maybe towards the high end of "sport" planes, it can be setup to fly well over 100mph, and land at trainer speeds. Most will be limited only by the pilot's abilities. The Revolver 70 is one of the planes Ive been looking at. I recommend the Great Planes Escapade 60. I have one and it's a great flyer. It's a bit on the heavy side which makes it a very stable flyer in the wind and it has a great, steady glide to it on final. Not a floater but not a rock either. I have an OS 65AX in it but had to add 4 oz of lead to the nose, making the airframe suitable for a bigger and heavier engine. It can be configured with or without the fiberglass cowl. It's built with cowl cheeks that you would cut off if you elect to mount the cowl, which would look good with an inverted mounted engine. OX 65 weight is 23 oz and the DLE20 is 29 oz (with ignition). Add the 4 oz of lead with the glow engine and you have 27 oz in the nose. So, only a 2 oz difference between the engines. The 20cc is very doable in this plane and the added power would make it fly great. The stance can handle a larger prop as well, leaving good ground clearance. Was kinda like asking "what's the best car?' One size does not fit all. There are many good flying planes out there and some not so good. I think a better question would have been "what panes to avoid" I love my Kaos 90, but you may not, but that's my style. It sometimes takes a long time to find the perfect plane, but look at the flying experience you gain during that time. I hope you find what fits your style perfect. Lots of good suggestions here. Ultra Sport is the best!